I have read a number of recommended packing lists for bug out bags that are posted on the web, and many of them are good. But almost none of them that I have seen even mention a cleaning kit for whatever firearms you may be carrying. Weapon cleaning and maintenance is certainly not rocket science, but it seems to be a subject that many preppers think little about. Theoretically, BOB should keep you going for three days minimum. And a lot can happen to your firearms in three days depending on weather and other conditions. Rain, dust, dirt, use, all can make your firearm inoperative quickly. You can keep your bullet launcher launching bullets with a bare minimum of items: Pull through (or bore snake) with proper size brush, toothbrush, solvent/lubricant, a clean rag and the right size patches. I am a great fan of the Hoppes Bore Snake. I started using them in Afghanistan and they work wonderfully for a quick bore cleaning. They are also washable. When it comes to solvents/lubricants there are a lot on the market, and everyone seems to have their favorite. The idea is to be able to effectively clean the gunk out of the chamber/bore and properly lubricate the action. I prefer lubes/solvents with Teflon in them such as Rem Oil as they tend to provide lubrication even when dried out from the heat of firing. But when it comes right down to it, you could get by with basic 10-50wt. motor oil if you had to. ( I can hear the purists screaming now. 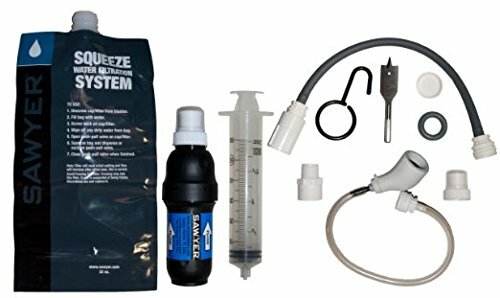 But I have done it and it works fine).These items placed in a waterproof freezer bag will get you by. For some rifles like my AKs, I like to carry a small tube of rifle grease. If you are carrying multiple calibers or want to be able to maintain weapons of different caliber you might come across, Otis makes a line of small muticaliber kits that are really first class. I carried one of their tactical kits in Afghanistan along with a bore snake and it rides in my bug out bag now. It has a pretty nifty pull through of its own and can clean bores from .17 through .50 caliber. The case zippers up into a small round package that fits easily in your BOB. Having a small, lightweight and practical cleaning kit in your bug out bag for your defensive weapons is easy and something you shouldn’t neglect. For quick cleaning I love the pull through type. For deeper cleaning I use a coated rod with bore guide. Foe really deep cleaning nothing beats the Outer’s Foul Out electronic system. I am a huge fan of the Otis kits and it is pretty easy to find one that you will match your pistol caliber and your rifle caliber. They can produce the same results as a rod, but are not as easy to make multiple passes down the barrel. As to the lubricants, there are many. I have done some testing with Slip 200 EWL and Gunlube and they are both great. I am going to do some testing with Fireclean and Rand CLP this summer. Froglube works well in warm weather, but if it gets really cold you will probably want something else. If you have to improvise, Automatic Transmission Fluid (ATF) is pretty close to the chemistry of most gun lubes. It works well and is readily available. I think the various bore snakes are great,for temporary cleaning-and only temporary cleaning- until you can get to a proper cleaning rod w bore guide/brushes/jags/flannel patches/powder solvent,and copper solvent to remove copper fouling-especially if you’re shooting surplus FMJ rounds. Use a bore scope on a barrel that’s only been cleaned with a bore snake,then do the same for a barrel that’s been properly cleaned. That’s what ended my use of bore snakes with the exception of a trip through a barrel at the range,or when we’re shooting for a weekend at the property we regularly camp,fish and shoot at. I’ve got a little round Otis cleaning kit for my 5.56 and a Kleen Bore kit for my .45’s. Oh yeah, Frog Lube and some Sentry Solutions products too. I’ve used Sentry Solutions since I was in the Army way, way back in the day. I love the Otis kits. Well made and designed. Lots of good solvent/lubes on the market now.I havn’t tried Frog Lube yet but have heard a lot of good things about it and will give it a test try soon, probably as part of an article.